The bay area (Bill's Bay) is a Sanctuary area and no fish or any other sea creatures may be taken from this area. The sanctuary includes all the area bounded by lines joining the south end of the North passage, Point Maud, Monk's Head and the main reef due west of Monk's Head. Beach fishing only is permitted in this area but only between the south end of the bay and Monk's Head. Despite this there are plenty of options. You may fish from the beach anywhere north of Point Maud and anywhere south of the bay. From a dinghy, fishing is permitted inside the reef south of Monk's Head or north of Point Maud. There is a boat launching facility located South of the townsite with ramps for two trailer boats together with a large parking area for trailers. 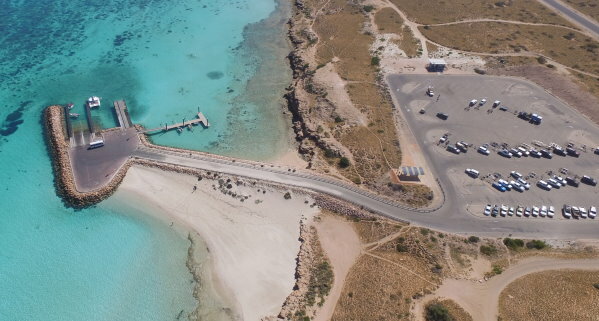 Access to the boating facility is via Banksia drive, turn just East of the Backpackers Ningaloo Club on the way into town and follow the bitumen road. With a larger boat, fish outside the reef where the variety of fish is only exceeded by the number of spots to catch them. To reach the outside of the reef there are two options. Firstly there is the North Passage. This is about 5 Km north of Point Maud and is a wide, deep, safe all weather passage. Its only disadvantage is that other than at high tide when you can navigate across the bay it is a long way to get there. Access is via a channel marked through the coral just inside the reef. Boaters would be well advised to mark the position of the most northerly markers for their return from the North passage so as to find them more easily. The other option is the South Passage (Yalobia Passage) which is about 6 Km south of the bay and immediately West of the boating facility . This is a fairly narrow break in the reef and in certain weather conditions is not navigable. It is marked by three markers on the hill onshore. 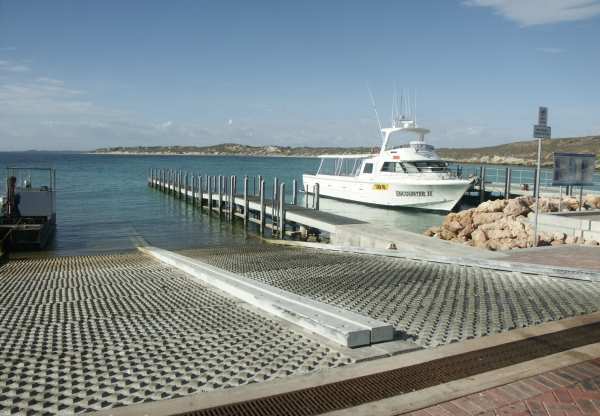 It is a convenient way to access some good fishing spots but only if the weather is suitable. Inside the reef you are most likely to catch Spangled Emperor, Sweetlip, Charlie Courts ( a small but tasty cod), Trevally and Squid. However venture outside for all of those plus Red Emperor, Pearl Perch, Rankin Cod, Robinson Seabream, Baldchin Groper, Coronation Cod, Mackerel, Wahoo, Sailfish and more. All these species can be caught close to the reef however your chances of catching the prized Red Emperor are better further offshore. 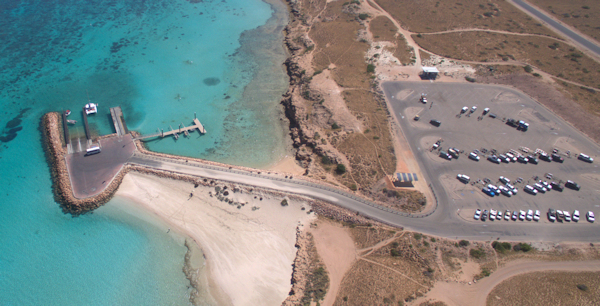 The whole Ningaloo Reef area is a Marine Park and there are special bag limits as well as possession limits. Download the Recreational Fishing Guide - Gascoyne Region for details of limits allowed. Check with the Fisheries Dept for more details. Fish must be landed whole, not filleted at sea so they can be inspected by Fisheries Officers. Public fish cleaning tables are available on shore. The coral is a precious asset. Treat it with respect. To avoid damage only drop anchor in areas with sandy bottom. Safety is an issue which should always be foremost in the mind of boat fishers. Coral Bay Sea Rescue monitor Channel 90 and VHF. A good marine radio is an essential in this environment as are other safety items such as an EPIRB, flares and lifejackets etc. There is a lot of coral close to the surface and the tide variation is sometimes in excess of 1.5 metres so beware of prop damage and allow for the tide when mooring on the beach. If you go out the South Passage and the weather conditions change you may not be able to come back that way. It is a long way around via the North Passage (about 28 Km) so make sure you have plenty of fuel and enough time. It is almost impossible to navigate safely at night in these waters.